"But earth's climate has always gone through natural cycles up and down, from hot to cold and back to hot. There even used to be crocodiles and palm trees at the North Pole!" That is precisely why the world's climate scientists are so alarmed - and have been, increasingly, since the 1980s. So rapid that global civilization is already stressed by it (for example in rising food prices) and that whatever we do, it will be increasingly dramatic for the next few decades while today's toddlers are making their way towards middle age. So dramatic that, if unchecked, by mid-century global security, agriculture, human migration and other basic underpinnings of civilization will undergo extreme transformation in efforts to adjust, say economists and political scientists in capitals and universities around the world. To say nothing of the massive extinctions of plants and animals already now accelerating as the rising heat and ocean acidification (both caused by the same excess CO2) disrupt natural cycles of feeding, shelter, fertilization and birth in plants and animals. This is the core of the entire climate/global warming story in a nutshell. There is no longer any substantive controversy among the world's peer-reviewed climate experts about these basics of the situation we find ourselves in - and that nobody meant to happen. Often, of course, this canard is passed along in innocent ignorance or confusion. Many have not heard about the relatively recent discovery of earth's great Icehouse-Greenhouse cycles, or still confuse it with the more familiar "Ice ages." But others who promote this canard are accused by widely respected scientists and journalists of knowingly promoting it and other misleading thoughts about manmade global warming, and thus of being guilty of "a crime against humanity." "Crimes Against Humanity" is a category of culpability that found currency in the last century as a label for such atrocities as genocide, including the Nazi Holocaust. This is a grave accusation, laden with great emotion, but it has not been made lightly - rather with extensive study and forethought. One of the world's most widely respected climatologists, James Hansen, director of NASA-GISS, which focuses on the study of earth's climate for the space agency, testified to Congress in 2008 that the CEOs of fossil fuel companies (who, according to various professional reporting have been promoting this and other misleading messages about global warming in conjunction with ideological groups trying to prevent government regulation) "knew what they were doing" and, as stated in his written testimony to Congress in 2008, were guilty of "high crimes against humanity and nature." Hansen tells ABC News - in a phone call from the U.K. where he's been traveling - that he used that highly charged phrase, crime against humanity, "not only for dramatic effect, but also because it is accurate, given the enormous scale of the consequences to humanity" if manmade global warming is not somehow stopped and reversed. "It wasn't only aimed at the fossil fuel CEOs," Hansen added on the phone. "This also applies to politicians who pretend the global warming is not manmade." Hansen cited the irony of Oklahoma and Texas politicians who, in the midst of severe drought that has been firmly linked by scientists to the long projected patterns of manmade global warming, are denying that link while also asking constituents to pray for rain. Hansen's preeminence among the world's peer-reviewed climate scientists is based partly on his depressingly accurate record. In 1988, he testified to Congress that manmade global warming was already under way and loading the dice for ever more frequent droughts and other major heat-related disruptions, and at a projected rate that has since proven accurate. Hansen is not the first to have carefully decided to call the climate disinformation campaign "a crime against humanity." Journalist Ross Gelbspan, whose professional accomplishments include directing a Pulitzer-winning investigation at the Boston Globe before he turned his attention to global warming in the 1990s, entitled a chapter in "Boiling Point," his second book on the climate crisis, "Criminals Against Humanity." The "criminals" he was referring to were fossil fuel and other executives who he reported to be intentionally promoting confusion and disinformation campaigns about solid findings of climate scientists around the world. He also reaffirms to ABC News (by phone from his home in Boston, where he maintains his website, heatisonline.org ) his considered intentionality in choosing that heavily freighted label for the actions of those who knowingly promote confusing climate canards. "I was not merely trying to be sensational," Gelbspan tells us, "but also accurate: The destruction and suffering that scientists show us manmade global warming is bringing … is enormous." 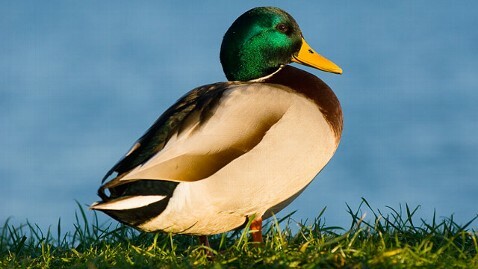 Like most canards, it gets vague and disorganized when you look directly at it, and starts to stammer. The grave accusations of Hansen, Gelbspan, and an array of responsible experts in academia and governments local, regional and national worldwide, is that this canard is given continual life by money from fossil fuel companies, the major source of the excess greenhouse gas, as well as from the buzz of rhetoric generated by anti-regulation ideological and political groups that are in step with the fossil fuel companies. Normally, the "Icehouse-Greenhouse" cycles rotate through super-long cycles that are measured in tens or hundreds of millions of years. They are not to be confused with the familiar "Ice Ages," which swing in far shorter cycles - roughly 120, 000 years - and far smaller temperature changes. Today, we're in the warmer part of an "Ice Ages" cycle - in one of the periods between Ice Ages, which are called "interglacials." We have been in the current interglacial since the last Ice Age ended about 10,000 years ago, when civilization got under way … but all in the midst of the current overall Icehouse Earth period. Humans, and all hominids, evolved well within the current Icehouse Earth period. These regular Ice Age cycles are long known by scientists to be triggered largely by predictable wobbles and other variations in the earth's orbit around the sun; these result in the polar regions being exposed to varying amounts of warming sunlight. What's frightening is that ice core records - which contains tiny bubbles of the actual air in given years going back more than 800,000 years - show that CO2 in the atmosphere rises just after the warming that is triggered by the predictable variations in the earth's orbit around the sun. Climate change deniers often cite this fact - foolishly or disingenuously - as proof that CO2 doesn't cause warming, but again (another canard) that's exactly the point. It's frightening to scientists because it seems clearly to show how any general warming may thaw out vast stores of natural greenhouse gases - CO2 and methane - that are trapped (during the decline of Icehouse Earth periods) in the frozen tundra and in near-freezing mud (called "clathrates") on the sea floor. And it is frightening because the current global warming is solidly linked by scientists not to any wobbles in the Earth's orbit but to humanity's injection of excess CO2 and methane into the air … that began when the industrial age started burning coal 200 years ago. This means the current warming may already be due partly to this secondary effect of additional natural greenhouse gases being thawed out and released into the air. The world's scientists report that computer models of earth's climate over the past 130 years (during which earth's temperature has been rising in step with the increasing injection of greenhouse gas into the air) show that if just one of the many variables fed to the computers is removed - the excess greenhouse emissions of the industrial age - then our current average temperatures would be flat or slightly cooling. That is, consistent with the natural "interglacial" (and Icehouse Earth) regimes we were in right up to the beginning of the coal-burning industrial age. That is, global annual temperatures, averaged over 20 or 30 years (the baseline standard climate scientists insist on) would be flat or, in some models, even slightly cooling. And this points to the most dangerous central fact the scientists report about manmade global warming … and why the "natural climate cycle" shrug is the first canard. Greatest Danger: The Overall Tipping Point - How Soon? The world's scientists know from ice- and seabed-sediment cores extracted from drilling down through mountain glaciers worldwide, polar ice sheets up to two miles deep, and sea beds around the world, that such rapid warming can - and has in the past - become at various points an unstoppable "runaway" process. They report a runaway warming seems to happen as the warming air reaches some average global temperature, which then thaws out enough of the vast stores of greenhouse gasses carbon dioxide and methane that have been buried in the Arctic tundra and seabed mud since the last hot cycle so that it then warms the air and deep sea currents even more, releasing yet more of the heat-trapping gasses … and so on, till a "Greenhouse Earth" is reached. And crocodiles and palm trees find their way, once again, to polar regions. Eventually - over countless eons - the excess greenhouse gas heating things up, especially CO2, is absorbed back out of the air by the CO2-breathing vegetation… such as the watery algae of the aptly named Carboniferous Period roughly 325 million years ago. That algae then slowly gets buried and compressed into coal, or contributes to other related forms such as oil and natural gas. Actually, all the above is mostly old news. This reporter conveyed most all of it some seven or eight years ago - when I started focusing in the global climate crisis - and I discovered then that a number of serious professional journalists had reported virtually all of it in previous years and even decades. The fact that we feel it needs telling again is partly due to the continued life of this Climate Canard No. 1. Due professional diligence for this Nature's Edge Notebook required re-checking, yet again, with appropriate experts - those who have committed their lives to wrangling the devilish details. I contacted paleoclimatologist (studies prehistoric climate) Dorothy Peteet, reaching her by phone at the end of her day at NASA-GISS. Peteet specializes there in studying "abrupt climate change," especially in the distant past, but with an eye on how what she learns about that might help us understand what is happening now. Like most hard-working professional scientists, she took care to impress upon me what she, and the world's paleoclimatologists in general, don't yet know. She explained, for example, that scientists haven't yet pinned down exactly why certain climate shifts occurred at such-and-such a speed in the deep past, and detailed important distinctions to be made about the rates at which temperatures have shifted up and down between cooler and warmer periods, sometimes settling in middle levels before plunging or rising again. But then I asked her about the general picture, depicted above. She paused on the phone for a second. She was on the way to pick up her daughter from school. "Yes," she said, "That is the big fear." ------ We invite you to follow our weekly Nature's Edge Notebook on Facebook (Facebook.com/naturesedge) and on Twitter @BBlakemoreABC.